Apple pie was the requested today and I took the opportunity to try out a new recipe. This is an adaptation from The Pastry Bible's Designer Apple Pie recipe. I actually have a similar recipe already on my blog, it is an apple tart. I love this recipe because it is absolutely beautiful. It is the perfect pie if you want to make a presentation, great for Thanksgiving. 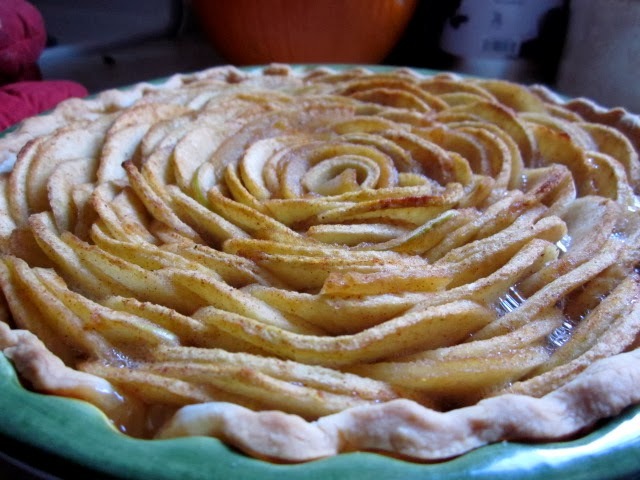 The main downfall with this recipe is cutting the apples into semi circle half moon shapes. I have a special apple peeler that also cores the apple at the same time. The result is some sort of apple slinky. Which I then cut in half and then I have lots of little half circle apple pieces. Cut 6 apples into half circles. Place the apples in a bowl with the nutmeg, sugar, cinnamon and lemon juice. Toss the apples and try to coat each one. But be careful not to break the apple pieces. Since the apple pieces are so hard I place the mixed ingredients in a large sauce pan and heat the apples and their juices until they are pliable. This takes about ten to twenty minutes on medium heat. Let the apples cool before the next step. Save the juice in the sauce pan, this will be used at the very end. Next place your pie crust on your pie pan. 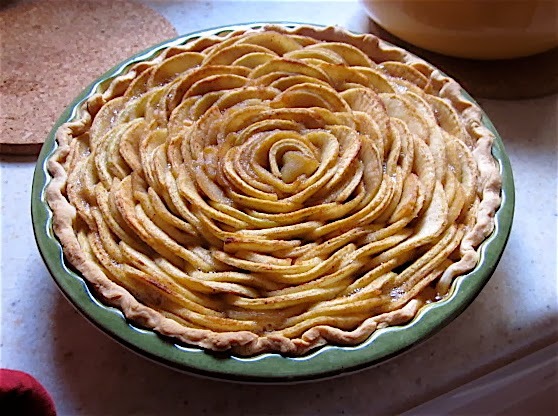 Carefully arrange the apple pieces around the outside of the crust. Try to layer them as compact as possible, pushing the apples back as you go. It the apples aren't compact enough spaces will appear between them during baking as some apples shrink. Continue to layer the apples in a circular fashion until only a small circle remains. In this circle, which should be in the center of your pie, take small pieces and bend them around each other. The goal is to make it look like the inside of a rose. Now bake the pie for 40 to 50 minutes. Feel free to bake it longer if you wish the apples to be softer. For the first 25-35 minutes I bake it with tinfoil around the crust so it doesn't cook too fast. Let the pie cool for about 10 to 20 minutes and then pour the juices from the saucepan over the pie. When the pie first comes out of the oven you can hear it bubble or sizzle. The pictures really don't do the pie justice. Nothing compares to the smell and bubbling noise from a freshly baked pie. Enjoy the pie with friends for best results, and compliments :). I bought this pie crust instead of making it and so I ended up with an extra crust. I usually take this opportunity to make a pumpkin pie. 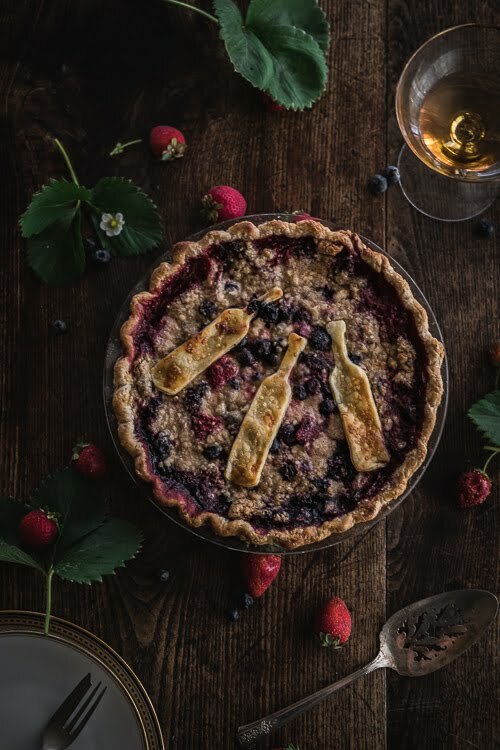 These two pies together are perfect for the holidays. I would also add my vanilla ice cream recipe to the mix for the best overall performance. Made this pie...it was pretty dank. Nice because of the small amount of sugar. Actually tastes like apples and not sugar syrup. Slicing the apples thinner worked great at keeping them nice and soft with shorted cooking times to not burn the crust.